Look up in the sky. It’s a bird. It’s a plane. It’s Iron Man. With all due respect to Superman fans, when it comes to visibility and popularity, not to mention style, the alien in embarrassing tights can’t hold a candle to Tony Stark and his rocket-powered armoured suit. But don’t blame Hollywood’s The Avengers franchise. Iron Man has always had a weapon the Man of Steel can’t match. Superman spends most of his time hiding behind glasses as Clark Kent, toiling away for chump change at a daily newspaper. Even if he can type faster than a speeding bullet, story meetings and research eat away at his time as a superhero. As a billionaire industrialist, Tony Stark never worries about deadlines or pleasing a boss. In other words, even when not in character, Iron Man can tackle the planet’s troubles while Superman is stuck simply writing about the world’s woes. Money is as powerful as good intentions. But fear of losing it typically scares business people off Hail Mary save-the-world projects, unless they are like billionaire Elon Musk, who inspired Robert Downey Jr.’s version of Stark in the Iron Man movies. As one of the co-founders of PayPal, which was sold to eBay for $1.6 billion in 2002, Musk obviously sees value in money. But he still swings for the fences as head of electric car maker Tesla Motors and Space Exploration Technologies (SpaceX), a private-sector version of NASA, because he is determined to solve sustainable energy production and make humankind a multi-planetary species. “We need more comic book-style billionaires,” tweeted a Musk fan in mid-2012 after Tesla announced it was ready to begin delivering its Model S luxury electric cars, and SpaceX made history as the first private company to send a spacecraft to the International Space Station. True enough. Musk isn’t the only planet champion from cyberspace. Peter Thiel, another PayPal cofounder, funds Breakout Labs, a venture capital program targeting radical ideas that could make the world a better place (click here for more on Breakout Labs). Twitter co-founder Evan Williams supports The Climate Group, a not-for-profit organization calling for a massive scale-up of clean energy and infrastructure. 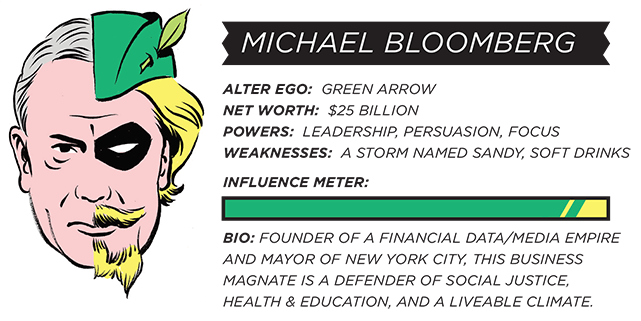 Matching other enlightened billionaires to comic book heroes isn’t hard. Warren Worthington III, the fictional winged billionaire known as Angel (and later Archangel), has nothing on former eBay president Jeff Skoll. After all, the dot-com legend flies high above other philanthropists for being one of the relative few individuals to have donated more than $1 billion in their lifetimes. 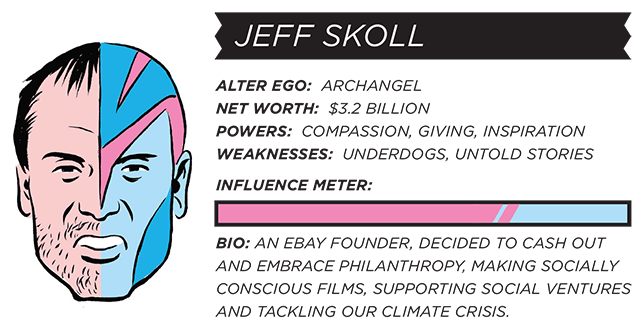 And like Angel, who used his fortune to finance superhero ventures like the X-Men, Skoll supports peace on earth by funding social entrepreneurship and producing edifying movies such as An Inconvenient Truth. Political activist Ralph Nader couldn’t agree more. He says there is no question that the world needs more billionaires like San Francisco hedge fund manager Tom Steyer, a cleantech investor. Steyer led a campaign that blocked Justin Hammer-like efforts by the Koch brothers to roll back California’s greenhouse-gas emissions law and bankrolled the push for legislation that will help finance energy-efficiency and clean-energy projects with funds gained by closing a corporate tax loophole. But what Nader thinks the world really needs is a Justice League-style group of billionaires dedicated to institutionalizing public interests and empowering the people. the battles that we never could,” Nader has tried to get billionaires to join forces to fight the good fight. In 2009, he published Only the Super-Rich Can Save Us, a roadmap for progressive change in America. In it, a fictional version of Warren Buffett is moved by the political paralysis that followed Hurricane Katrina to join forces with other super-rich individuals (and a few well-heeled celebrities) to take on the special interests and political dysfunction that stand in the way of making America a more just and sustainable nation. The good news, Nader says, is that it just takes one billionaire organizer to show what can be done. He thinks a senior citizen is required because young billionaires tend to lack perspective. 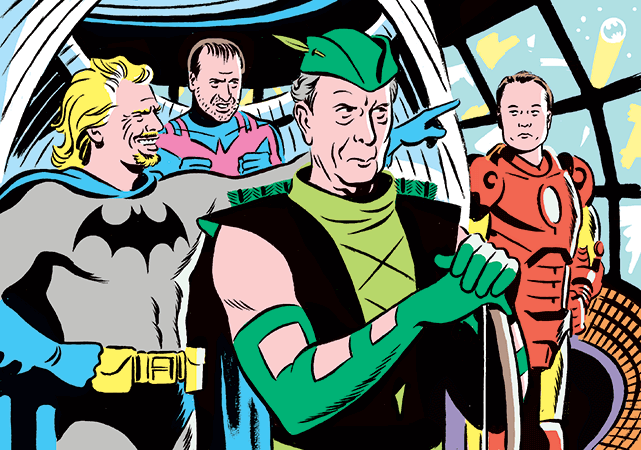 And since he recalls Ted Turner failing to get a response when trying to create a coordinated billionaire group years ago, Nader thinks Canada might be a better bet for the first formation of a “Billionaire League of Justice.” Musk was born to a Canadian mother and Skoll is full-blown Canuck, so Iron Man and Archangel could be on the team. As for a grey-haired leader, well, as luck would have it, Buffett wasn’t the billionaire credited with doing the most to shore up America’s leaking trust in capitalist society in the wake of Katrina. According to the New Orleans Times-Picayune, that honour goes to Austrian-Canadian Frank Stronach, whose generosity “shames us,” the paper said. After watching lame rescue efforts by U.S. authorities, the retired founder of the Magna International auto-parts empire sent a private-sector team to rescue hundreds of Lower 9th Ward residents while he rallied Canadian businesses to supply aid. Stronach then offered storm victims five years of rent-free accommodations in Canadaville, a new town built from scratch in central Louisiana that provided its original residents with counselling and job training and now serves as a disaster facility. Stronach, who is currently trying to save Austria from the euro, isn’t known to work well with peers. 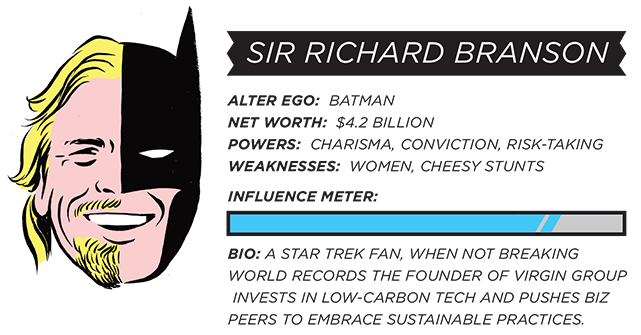 But leading a group of superhero billionaires would probably appeal to the self-proclaimed philosopher king’s ego.